I am on rush with fantastic pictures and memories from the time, that I spent in Cornwall. Previously I sketched out both my trips. Now I would like to continue through describing a small and big “cornish loop”. It was 3rd day of our 2nd journey to Cornwall, Monday. We slept in YHA Lizard Point and next carried on our trip. We made something like “big cornish loop” that day and similar “small cornish loop” on the following day (detailed here). Kynance Beach is the most photographed and painted location in Cornwall, the contrast between the cove’s white sand beach and the dark red and green serpentine rock produces a breathtaking sight. Pic. 1 The Kynance Cove sight. Pic. 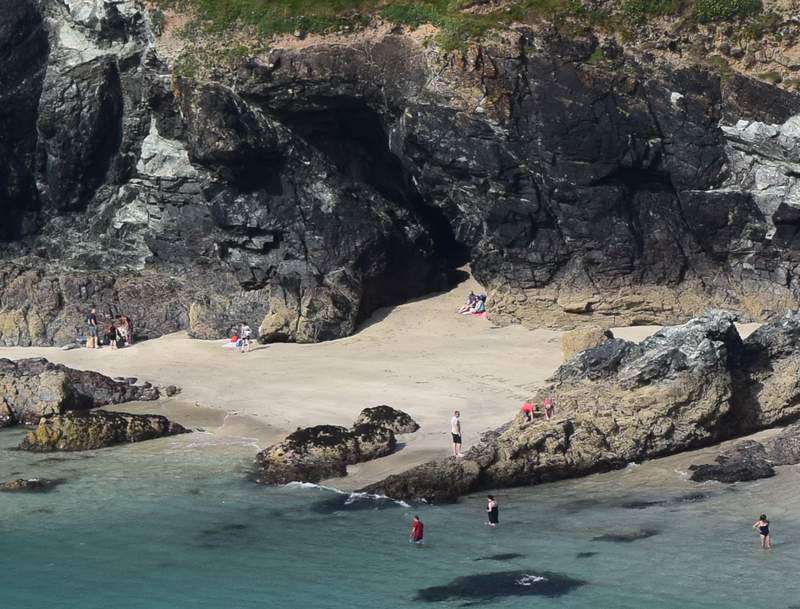 2 Zoom into Kynance Cove with fair sandy beach, 55 mm. 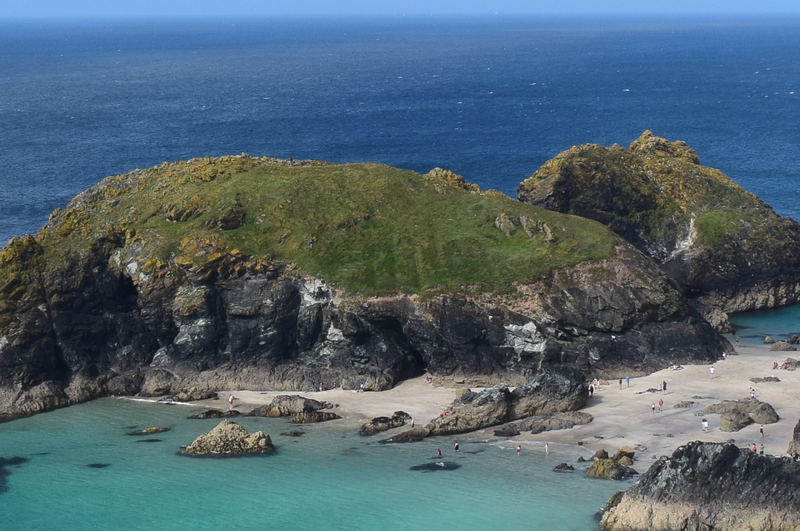 During the low tide you can explore the sea stacks or go inside Kynance Cove and a few another coves closely located. Pedennis Castle is located outide the Falmouth town. 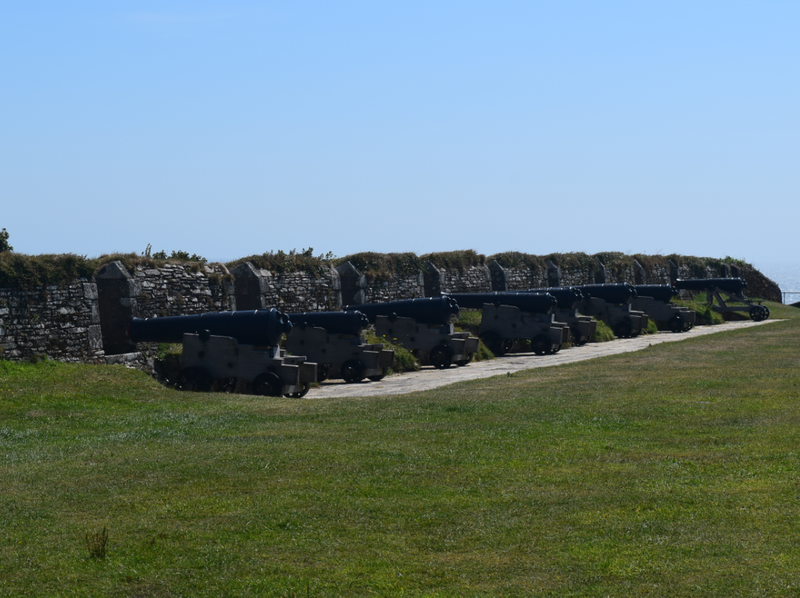 This is the amazing artillery constructed by Henry VIII in 1540s, located at the end of the penninsula. The fortification includes the original XVI-century Device Fort surrounded by masive outer defences. Closer to the shore you can see well-preserved gun batteries and a blockhouse. Pic. 3 Pedennis Castle, an example of XVI-century defence construction. Pic. 4 The gun baterries headed on Carrick Roads canal. Pic. 5 The Carrick Roads canal seen from Pedennis Castle. Pic. 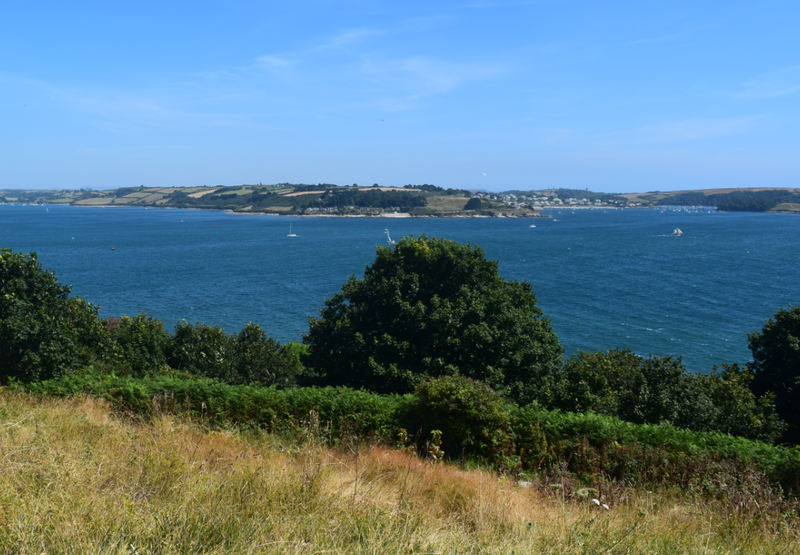 6 The Falmouth town seen from Pedennis Castle. 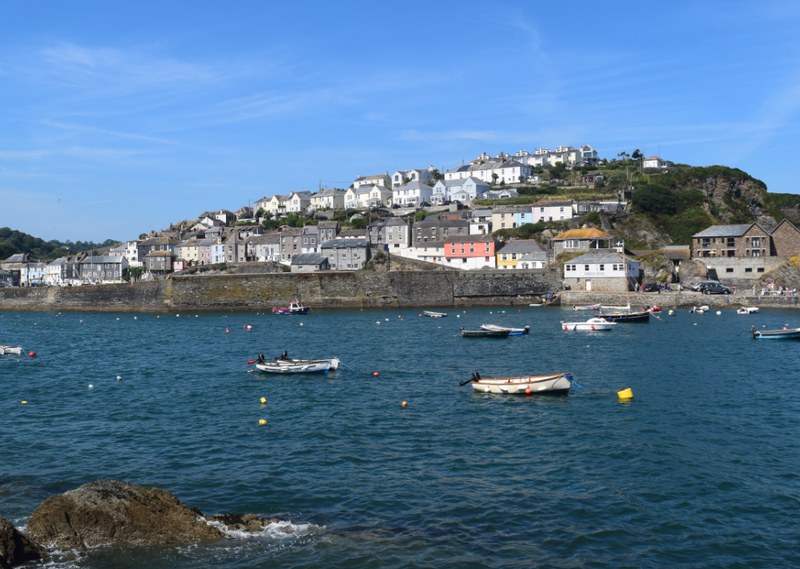 Mevagissey is a cosy fishing port located in south east Cornwall. This village has only 2k inhabitants. The most remarkable place here is the harbour. You can also take a short walk through the narrow lanes and passageways inside the village. The way from St. Austell to Mevagissey is also picturesque and leads along the shore. Pic. 7 Mevagissey – view on the harbour. 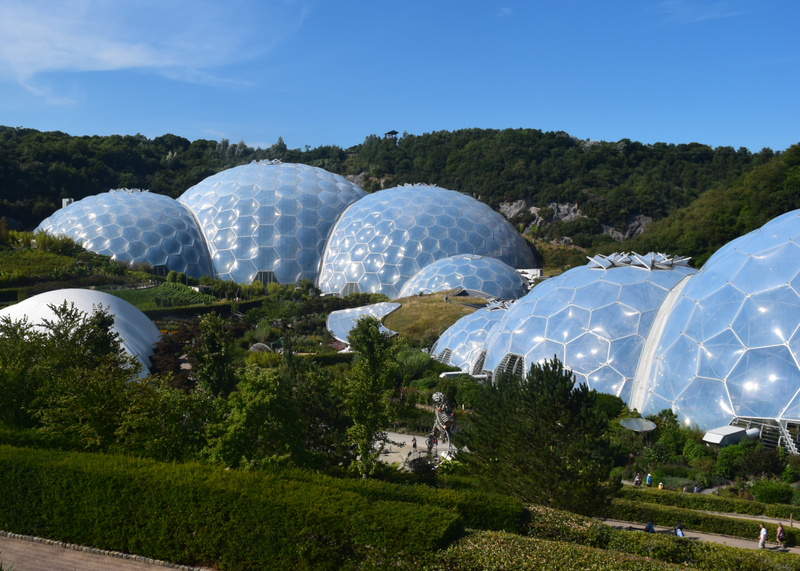 Eden project is one of the most popular place in Cornwall. This is a botanical complex, dominated by two huge enclosures consisting of adjoining domes, that house thousand of plant species. 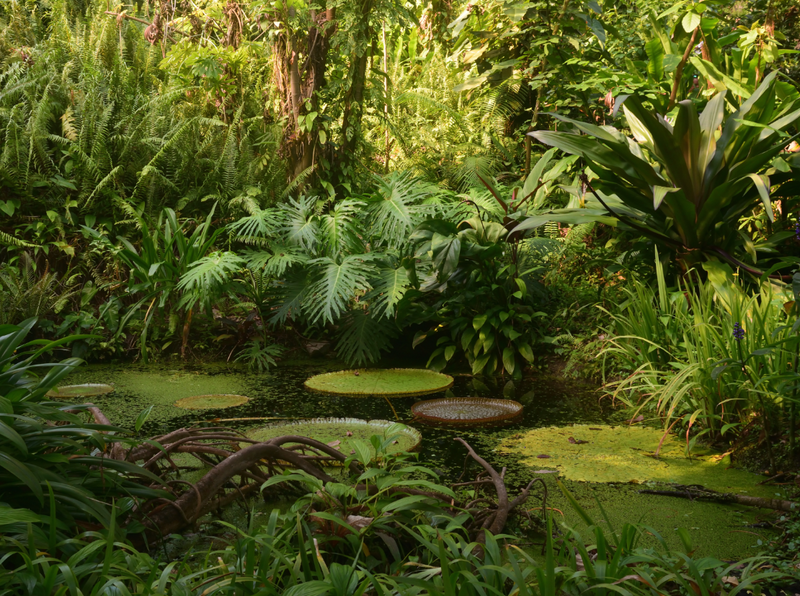 The biggest and the most remarkable in my opinion is the tropical biome, which covers more than 1,5 ha. Be ready for GBP 25 admission! Pic. 8 The Eden project. Pic. 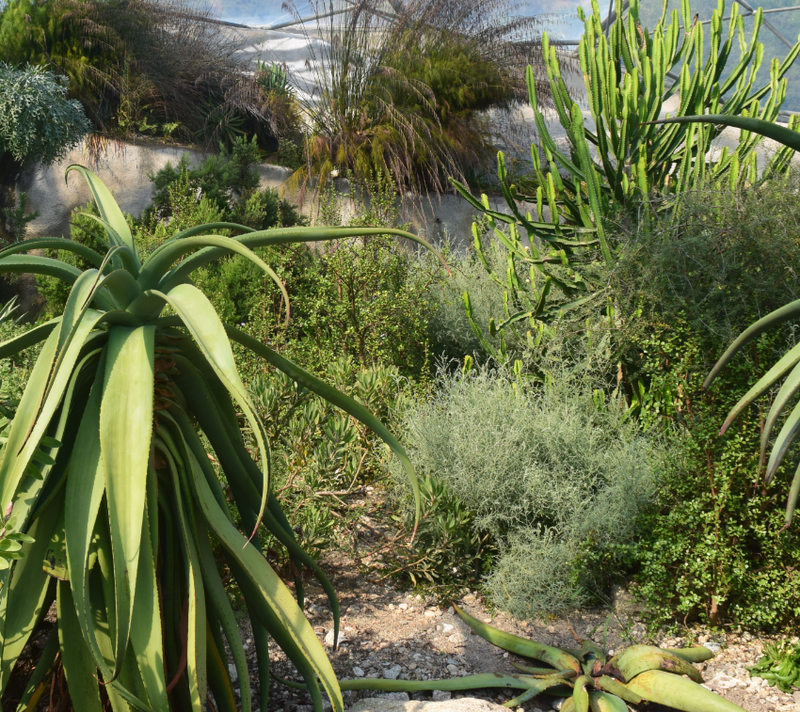 9 The plants from South Africa housed in the Eden Project. Pic. 10. 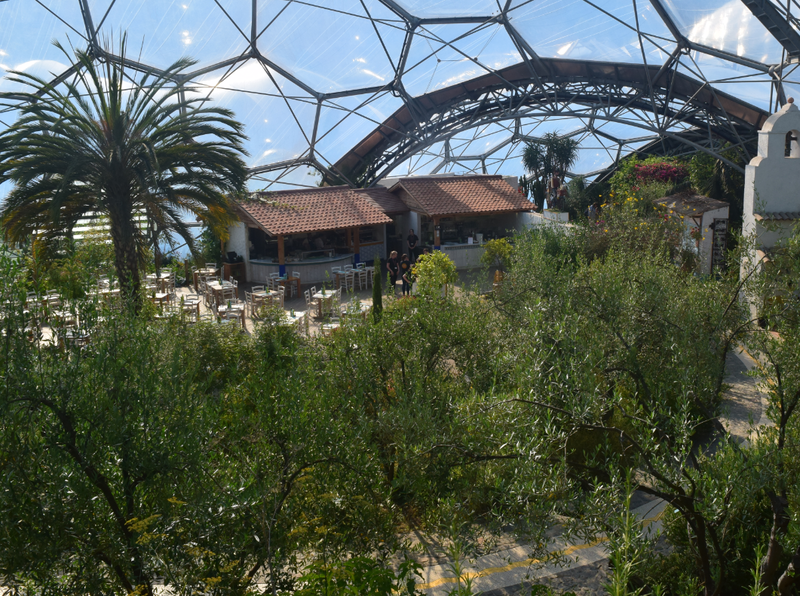 The tropical biome in the Eden Project. The Eden Project came into being in 2005. It had been built for several years in the former clay pit, which had been using there for more than 150 years. Pic. 11 The Mediterranean section in the Eden Project with some restaurant facilities beyond. 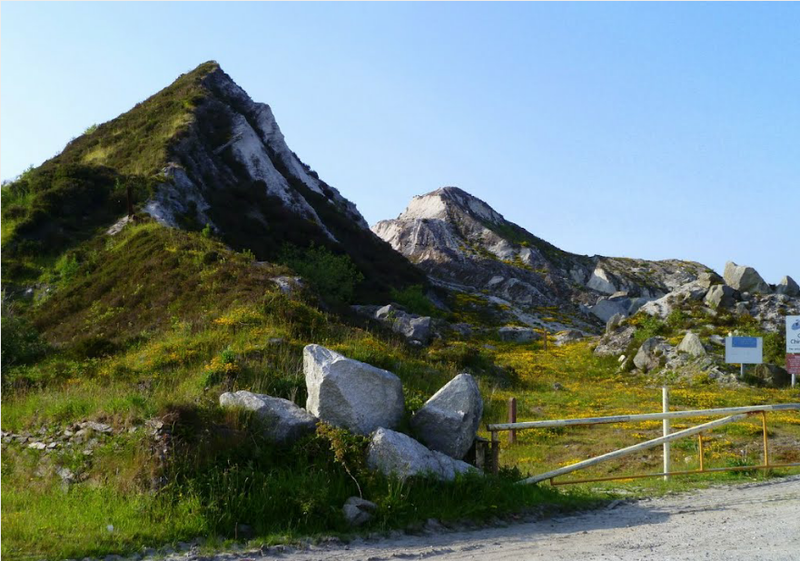 The Cornish Alps is called the highland region between A30 express road (villages Summercourt, Fraddon) and St. Austell. The highest mountain there is Hensbarrow Beacon, which rises around 300 m above sea level. 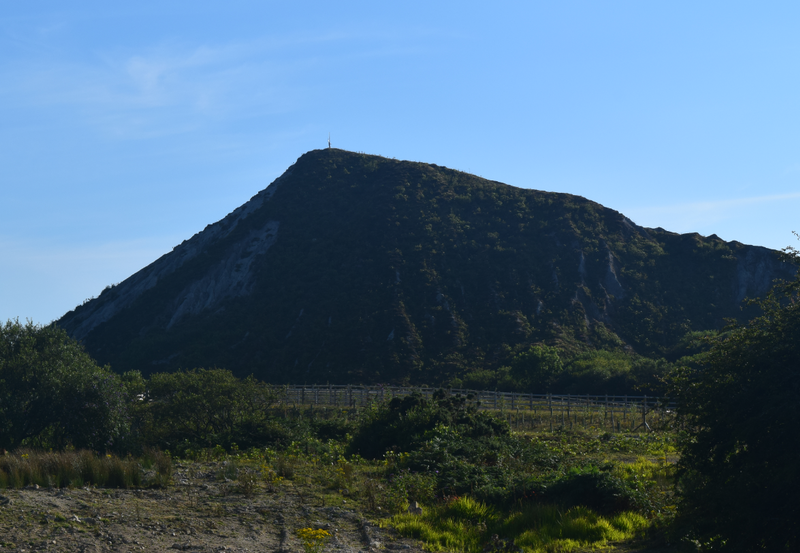 These euphemistically named “mountains” are the debris of China clay mining, that is the backbone of Cornwall’s economy for last 250 years. 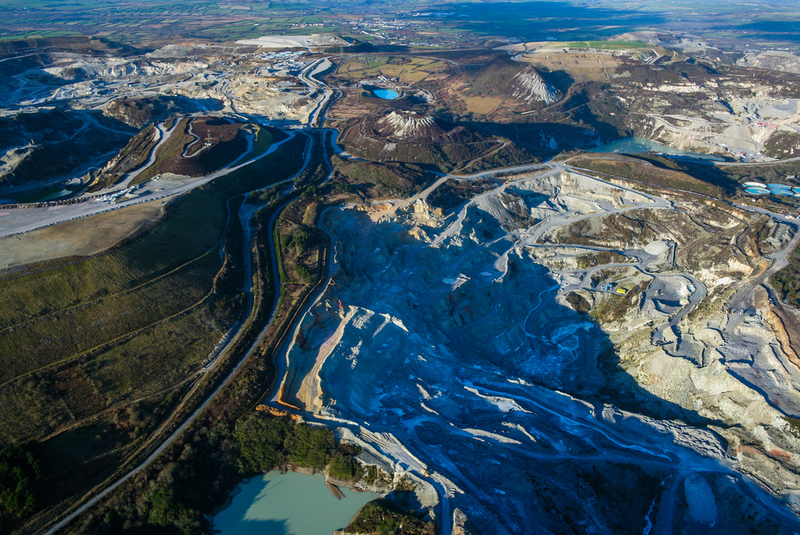 This is probably the best known source of china clay in Europe. Those sharp, fear peaks dominates the surrounding landscape. 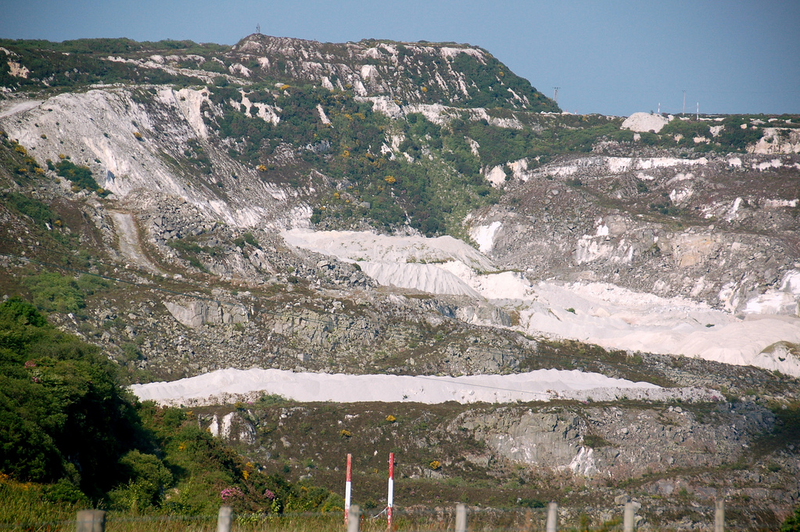 Under the China clay hides the kaolinite clay. 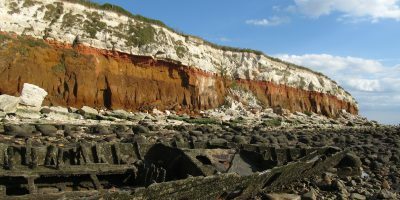 This rock developes in the areas of chemical weathering of rocks in hot and moist climates e.g. tropical rainforest areas. Pic. 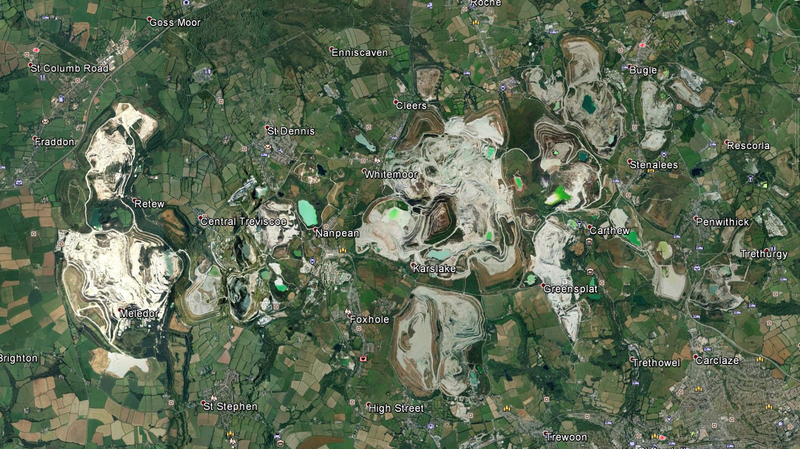 12 The Cornish Alps area in the Google Earth. Pic. 13 The Cornish Alps area near Witemoor seen in the Google Earth. Pic. 14 The Cornish Alps near Karslake village seen from bird’s view (Andrew Turner, flickr.com). Pic. 15 One of the sharp peaks in Cornish Alps near Hensbarrow Beacon area. Pic. 16 The Cornish Alps landscape. Pic. 17 The Cornish Alps landscape (James Stringer, flickr.com). Pic. 18 The Cornish Alps landscape near the Stenaless village (Margit Berger, flickr.com). The best view is from the south. 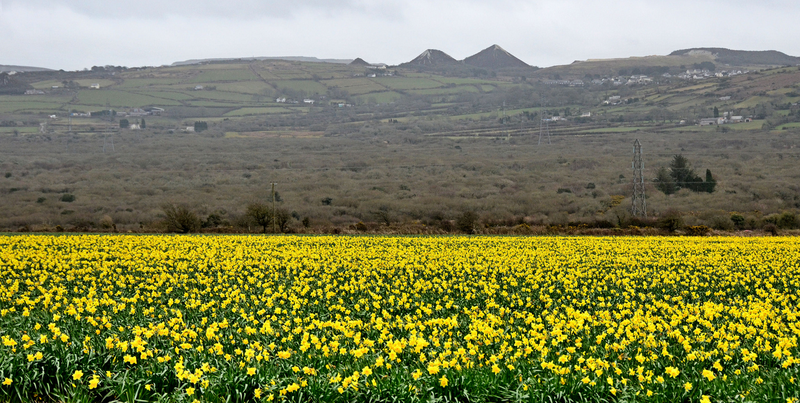 The best access to this area is from St. Austell town, which lies just a few scant miles from the Cornish Alps. Leaving the town you need to go towards Stenalees village and next to the Roche village. I can’t advice you local roads, because some of them may be out of use. This place was the most desired to visit for me as a geographer. For people, who doesn’t want waste a time to find a decend wiev inside the Cornish Alps I strongly recommend the road A390 to Truro or road A3058 from St. Austell to Newquay (pic. 20). When you back from Mevagissey is also a good opportunity to see the most representant part of this odd mountains. Pic. 20 The Cornish Alps seen from the A3058 road (flickr.com). 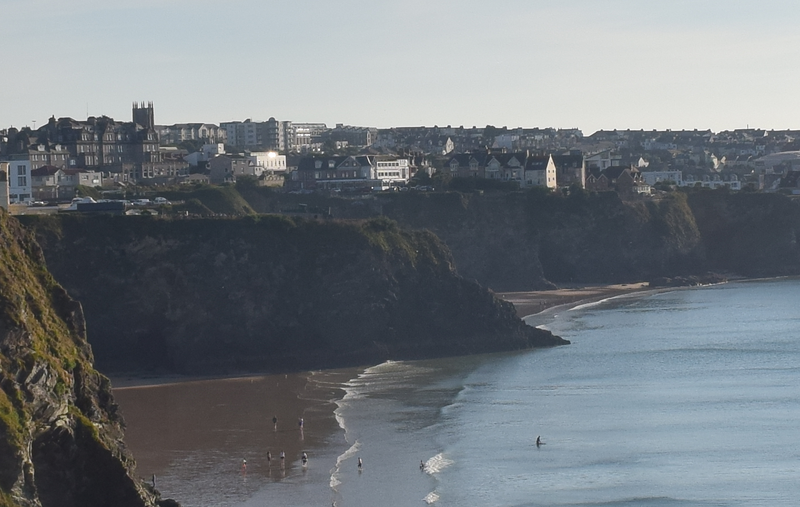 Newquay is a small town located on the North Atlantic shore. We hadn’t enough time to visit the town centre. We went on the beach only. I can admit, that beach in Newquay is really nice. 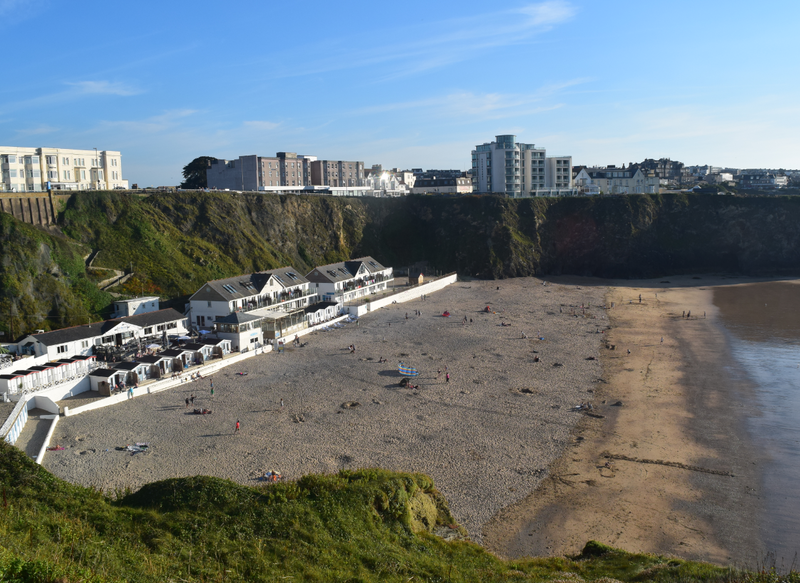 This is the Lusty Glaze Beach, located in the north part of the town. The acess is quite easy. From local airport is only 5 miles. If you are going A30 from Bodmin you must head on A39 and next in Trevarren choose A392. Just before the enter to the Newquay head on the Trevenson Road, next Henver Road and Arundel Way. Next you can think about parking your car and next had directly into the seaside. Pic. 21. View from Porth Beach Padlock Bridge towards north. Pic. 22 Newquay town seen from Porth Beach Padlock Bridge. Pic. 23 View on the Lusty Glaze Beach. 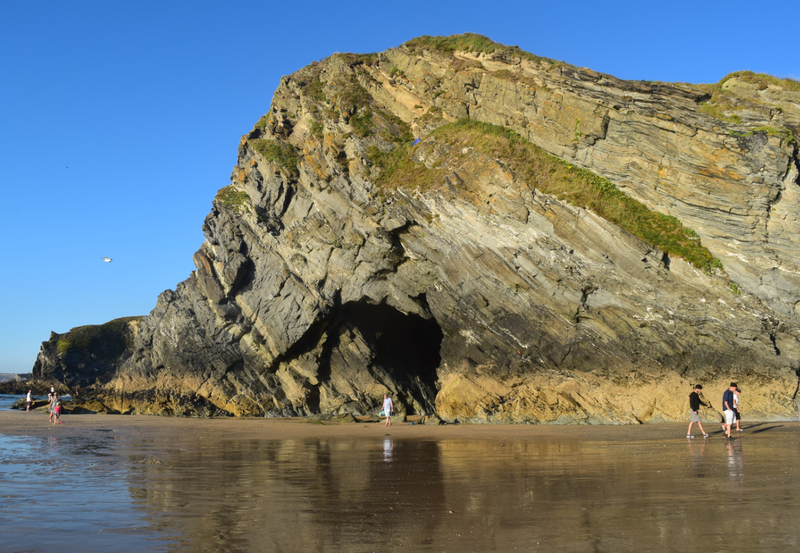 Lusty Glaze Beach is the most popular beach in Newquay. You have a lot of accommodation here. Pic. 24. 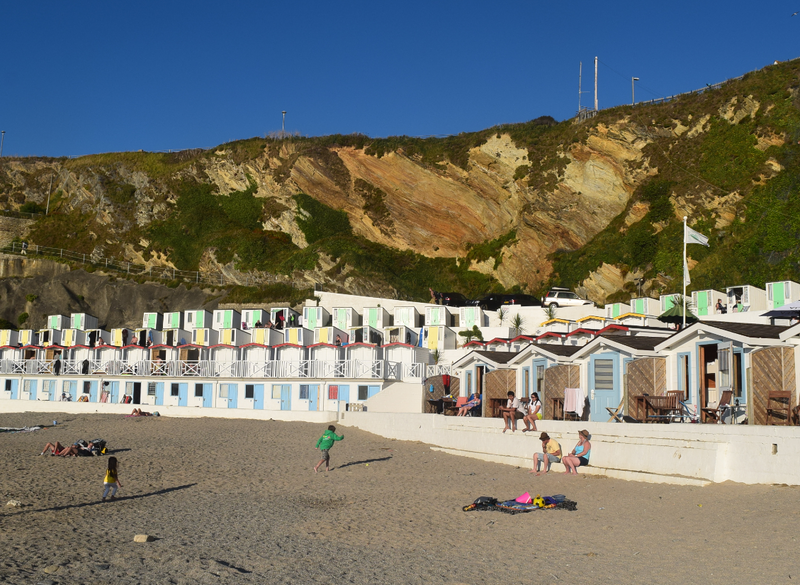 Lusty Glaze Beach accommodation. Pic. 25. 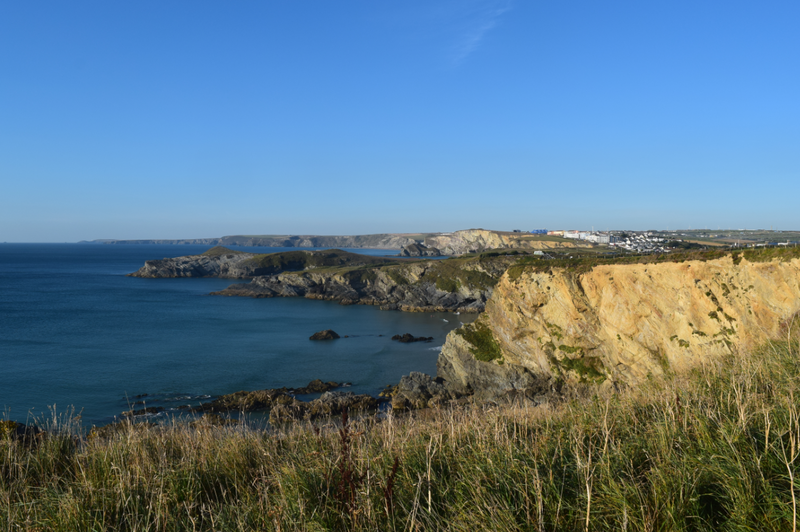 Lusty Glaze Beach – the cove and surrounbdings. Tha’s all for the one day commenced in Lizard Point. After Newquay we headed on our tent camp located near Land’s End Airport. Next day on Tuesday 15.08 we were managed to small “cornish loop”. This is the flag place in Cornwall. Everyone, who are going here want to see the small tidal island with a beautiful castle on the top. The civil parish community on this island counts 35 people. Pic. 26. 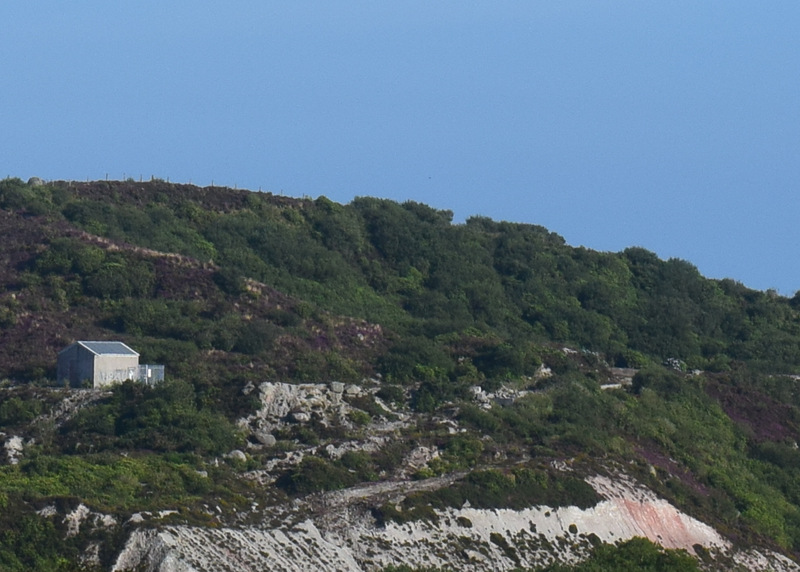 St. Michael’s Mount seen from the Mount Haven Hotel terrace, 135 mm. 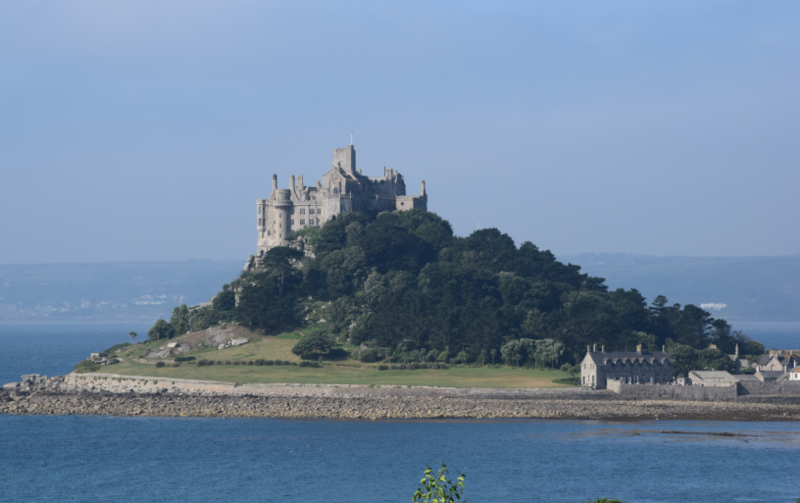 There is a problem to see the Mount from the centre from Marazion. It’s good to go to some coffee or hotel to have a beautiful view on the mount. We found one. It was a coffee in the Mount Haven Hotel, located just outside the town. 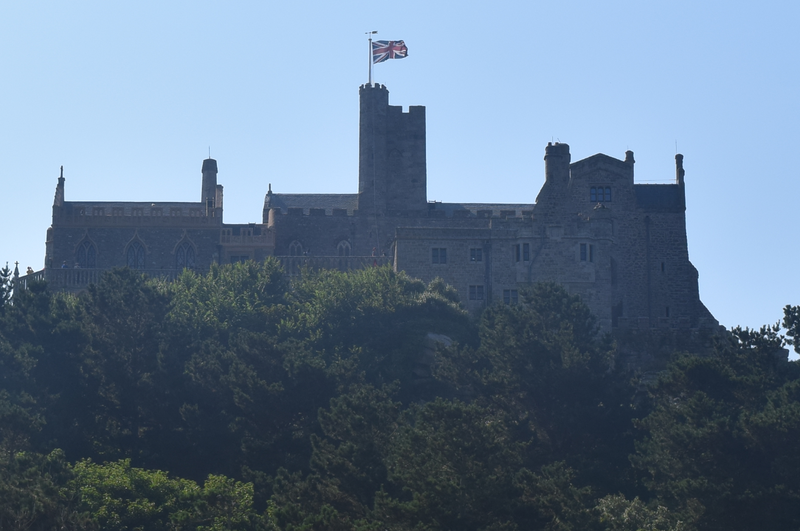 There was a perfect view on the St. Michael’s Mount from this elevated place. Pic. 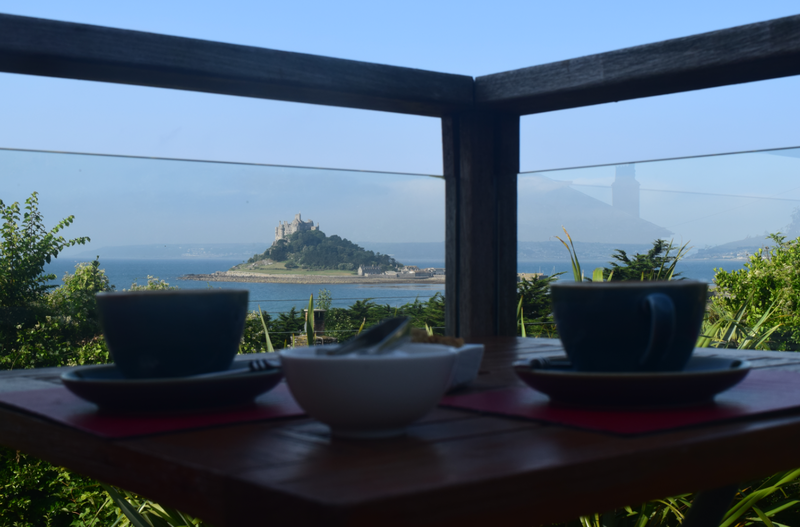 27 Coffee time with picturesque view on the St. Michael’s Mount from the Mount Haven Hotel Terrace. 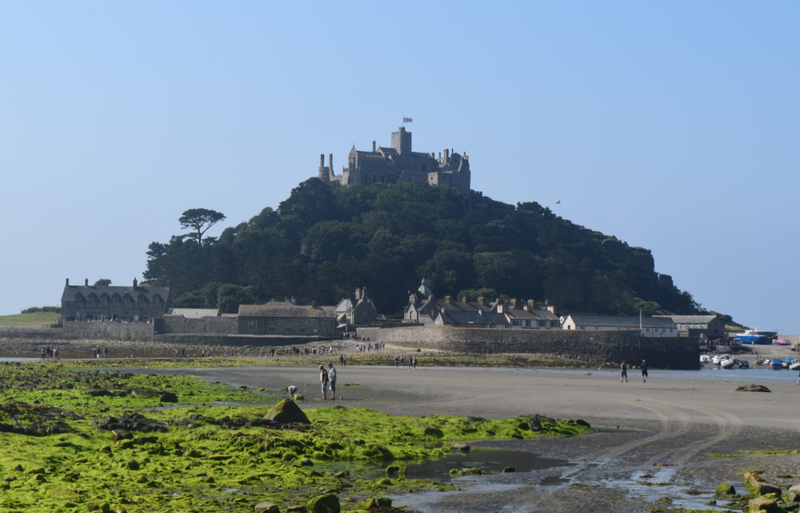 The St. Michael’s Mount is linked with the Marazion town by man-made causeway of granite setts, passable between low-tide and mid-water. Pic. 28 The St. Michael’s Mount seen during the low tide near cobbled causeway. Pic. 29 Near view on the castle, 55 mm. 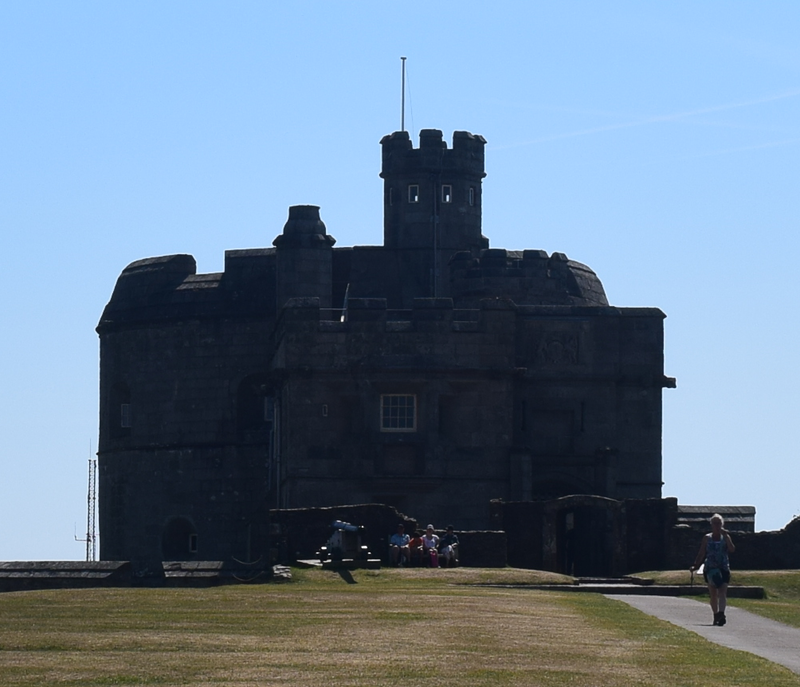 You can enter on the Mount area, however the admission to the castle on the top is payable. This object belongs to National Trust. We were enjoy to see the castle from the bottom. Moreover you can enjoy a good view on the surrounding area. Penzance and Marazion town are clearly visible from this place. Pic. 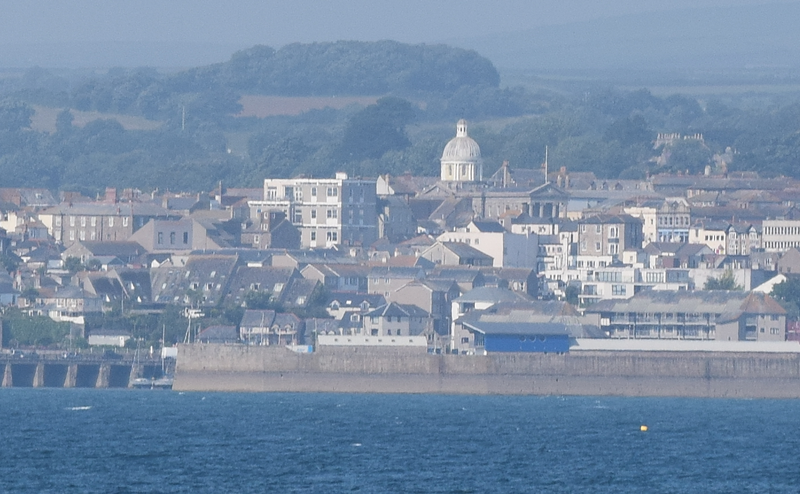 30 View on the Penzance city centre with the most prominent building housing the Lloyds Bank today, 300 mm. 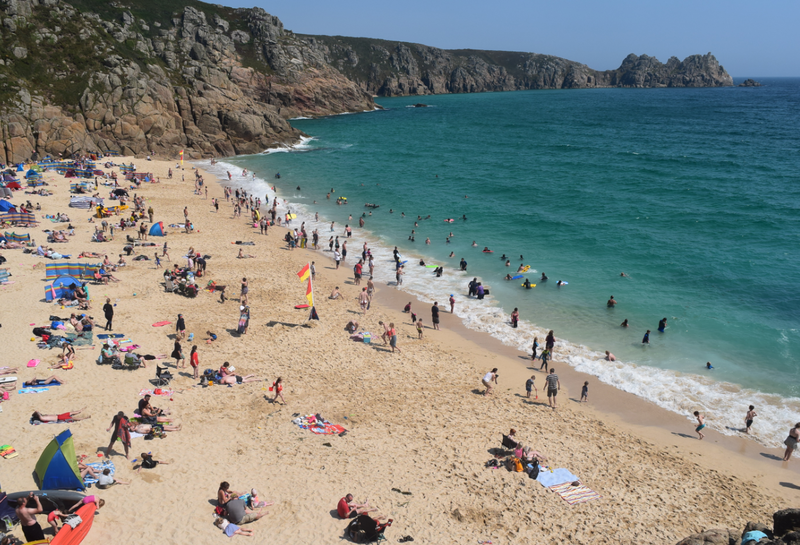 Some people think, that Porthcurno is the best beach in whole Britain. The area is stuck between two vast rocky walls and then continues by small gully extended towards the village centre. This is amazing triangle-looking sandy beach. Two main downsides of this beach are: weather and seawater temperature. We were lucky, because during our 4-hours stay weather was really nice, except quite strong wind, which was generating a big vawes (I enjoyed it). Neverthelles you should remember, that in this place all year round rain takes hold and temperature higher than 25 deg happens only rarely!. It influences to the seawater temperature, which is not higher than 15 deg usually. Anyway I would strongly recommend this place. Be prepared to big traffic during the nice weather and try to park your car even outside the village. Even 2 km walk is far better than jam in traffic. Pic. 31 View on the Porthcurno beach. Pic. 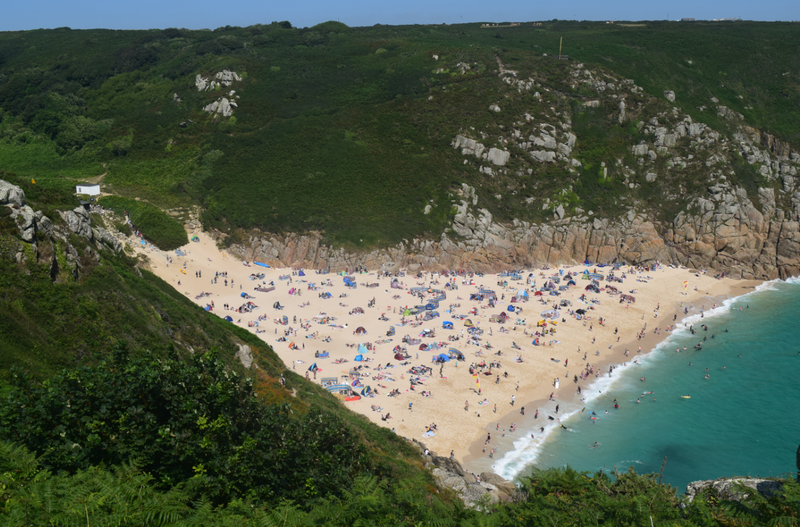 32 View on the Porthcurno beach (2). 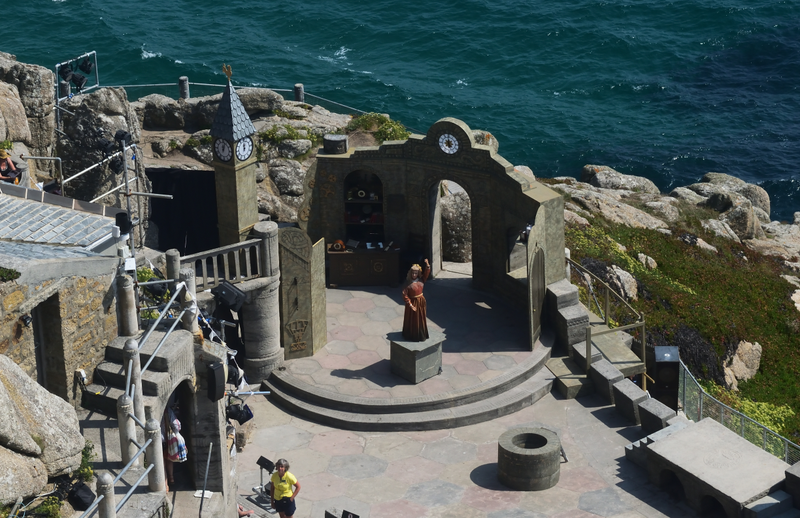 The Minack Theatre is an open-air theatre located on the rocky outcrop jutting above the sea. “Minack” in Cornish language means a rocky place. This is one of the most spectacular theatres in the World. The object has been built in 1932 for alocal village club players, who had staged Shakespear’s A Midsummer Night’s Dream every year since 1929. Pic. 33 The Minack Theatre seen from the top. 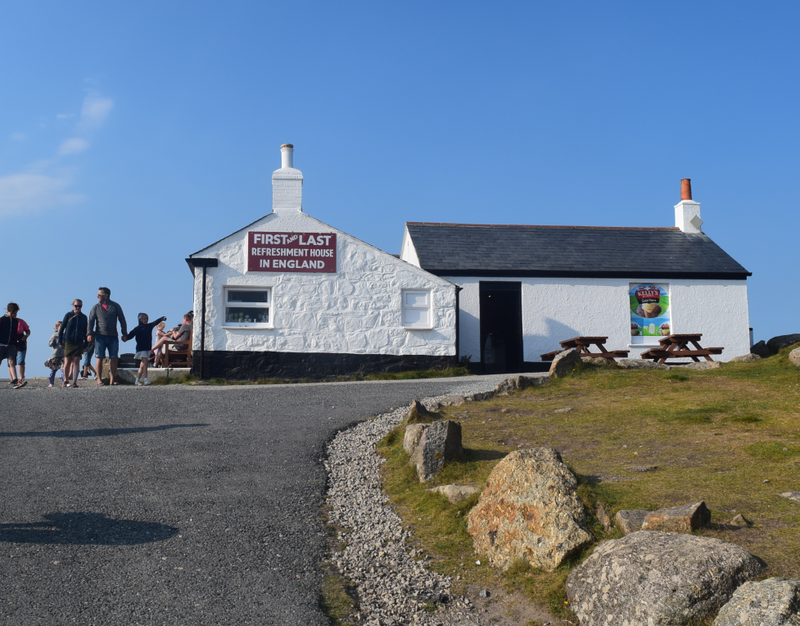 Land’s end is the most westerly point in Cornwall. There is a big holiday complex and shopping village. Pic. 34. 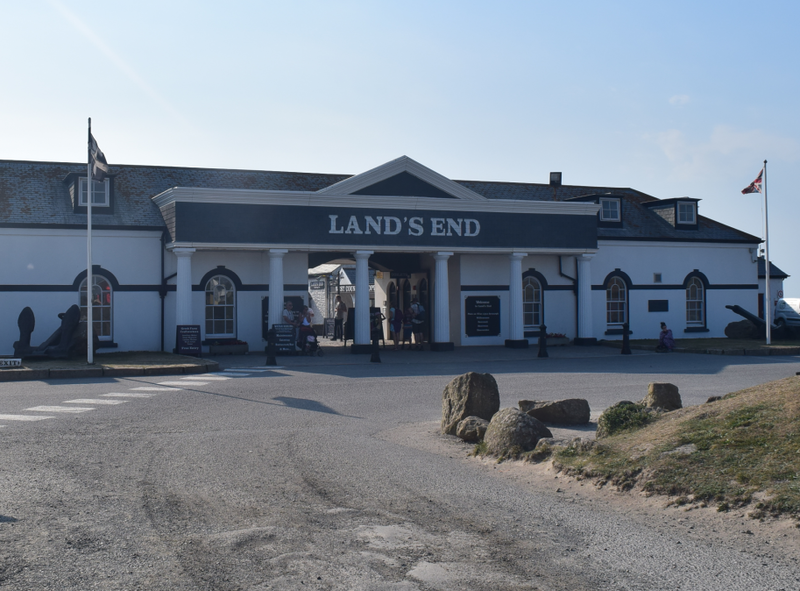 Land’s End village entrance. Pic. 35 A first & last house in Britain. Pic. 36. 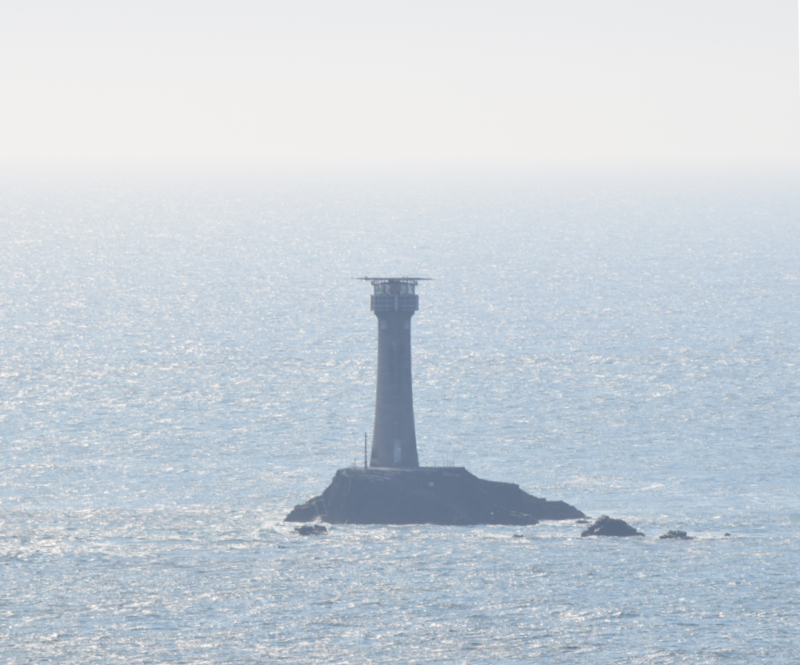 The Longboat lighthouse seen from Land’s End. Land’s end is also the place of beautiful cliffs. During the pristine weather you can see the Isle of Scilly from there distance around 45 km. I was trying to see it, unfortunately in vain. It was a really hazy day, when we came on the Land’s end, a last day of good and warm weather. 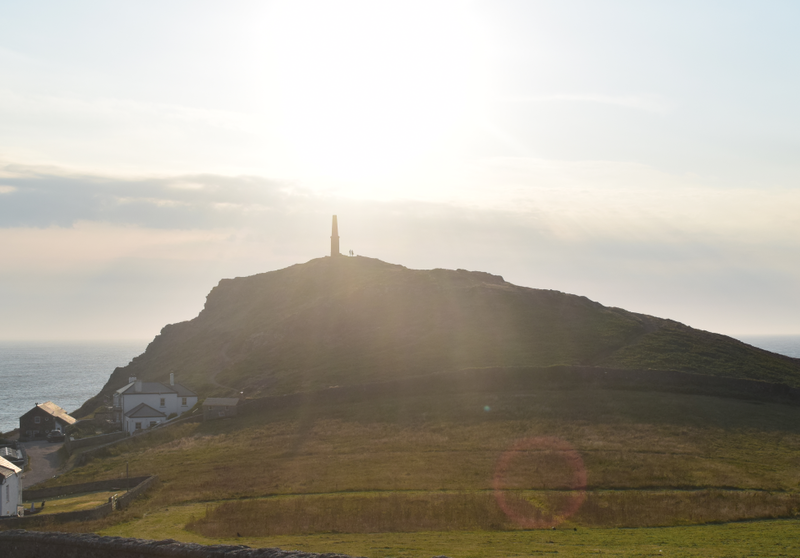 Cape Cornwall provides a really breathtaking scenery. This is the place, from where you can see a owe-inspiring cliff rocks, Land’s End and atypical industry buildings in the nearest village. Pic. 37 View on the Cape Cornwall. Pic. 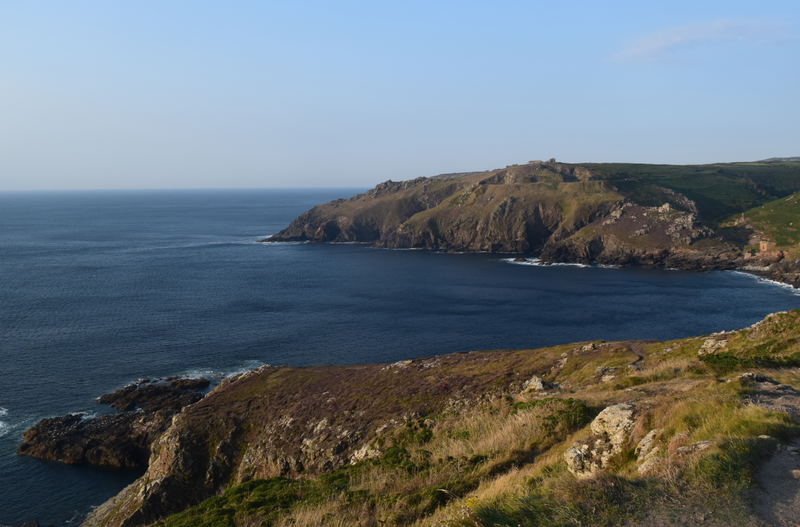 38 Rocky cliffs seen from the Cape Cornwall, view towards north east. Pic. 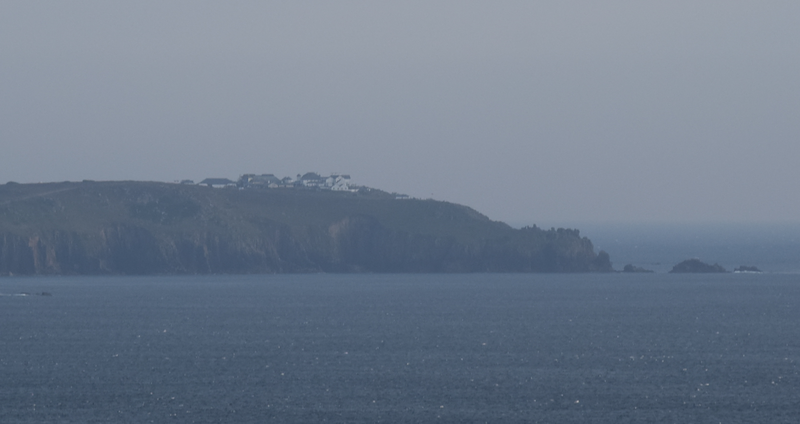 39 View on the Land’s End from Cape Cornwall, 135 mm. Pic. 40 The tin mine remnants seen from the Cape Cornwall, 55 mm. Near to the Cape Cornwall the Botallack village is located. 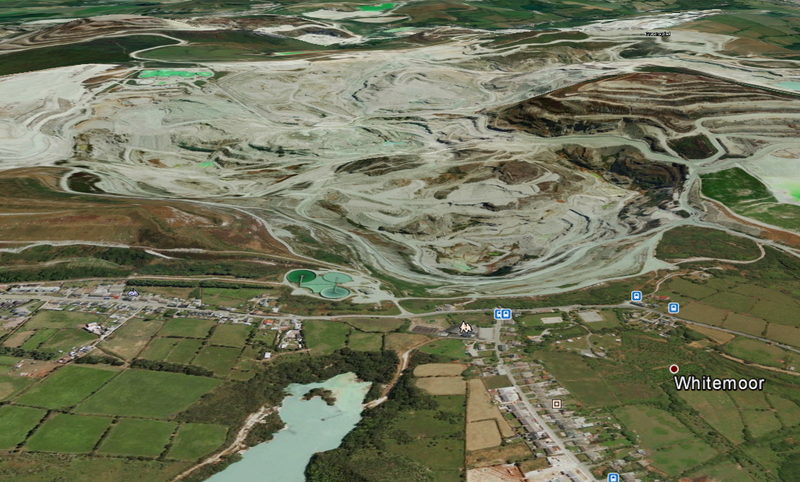 This is the most popular place to see the former tin mines in Cornwall. 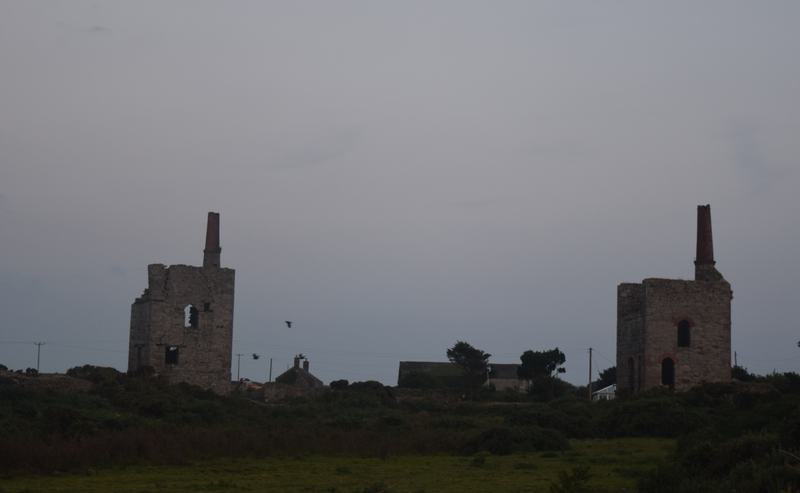 We toured the another one – Carn Galver Engine House, which lies next to the B3306 road from St. Just to St. Ives. I think, that this object is easy accessible. On top of that this is not only one, that is situated near to the road. Pic. 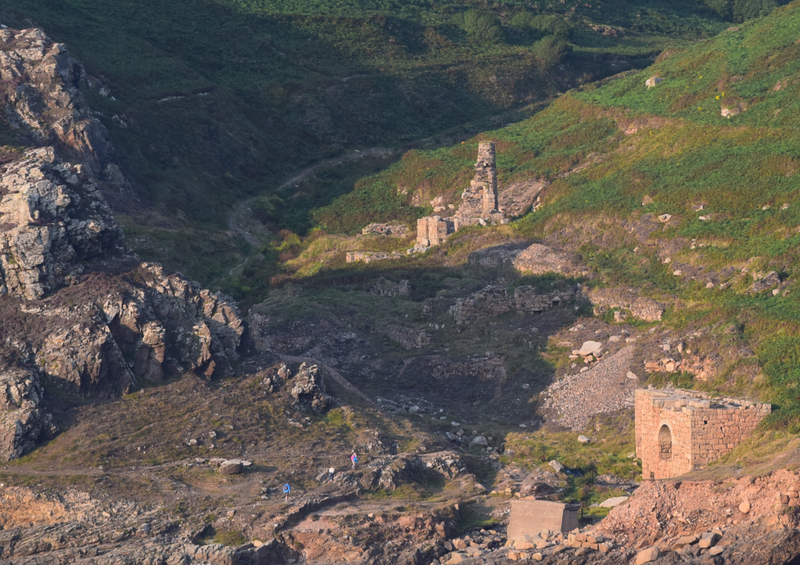 41 Cran Galver Mining House – one of the tin mine example in Cornwall. Pic. 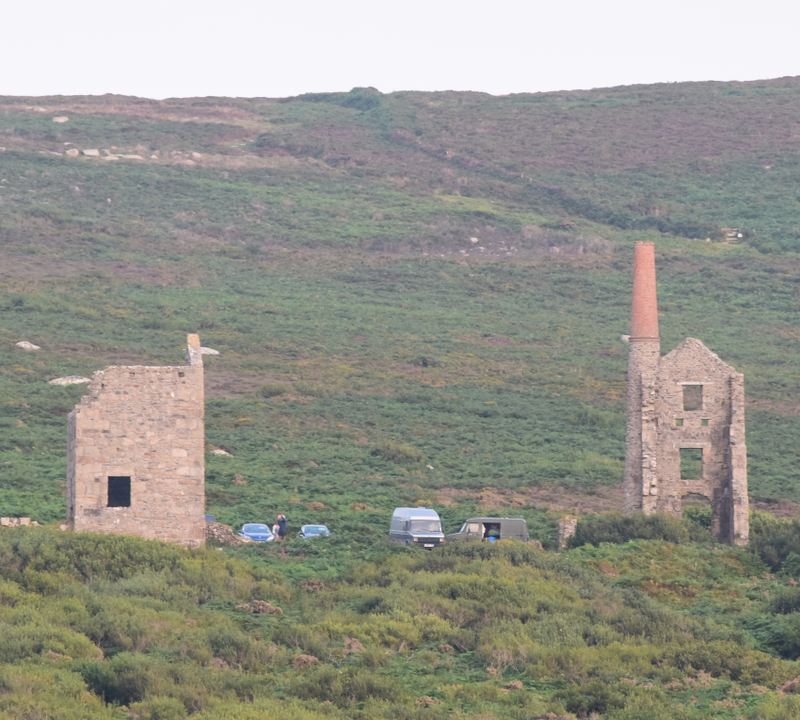 42 Another tin mine examples near Pendeen. The mining tradition in Cornwall lasted nearly 400 years. 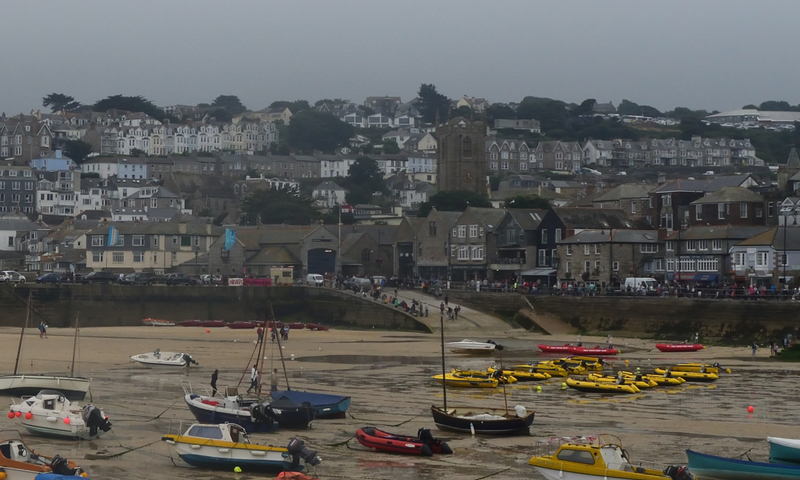 Our last port of call in Cornwall was the ferry town St. Ives, which we saw on Wednesday. On our way down to Okehampton and next to Oxford we stopped by for 2 hours to scout this place. Formerly the economy of St. Ives was depending of fishing. 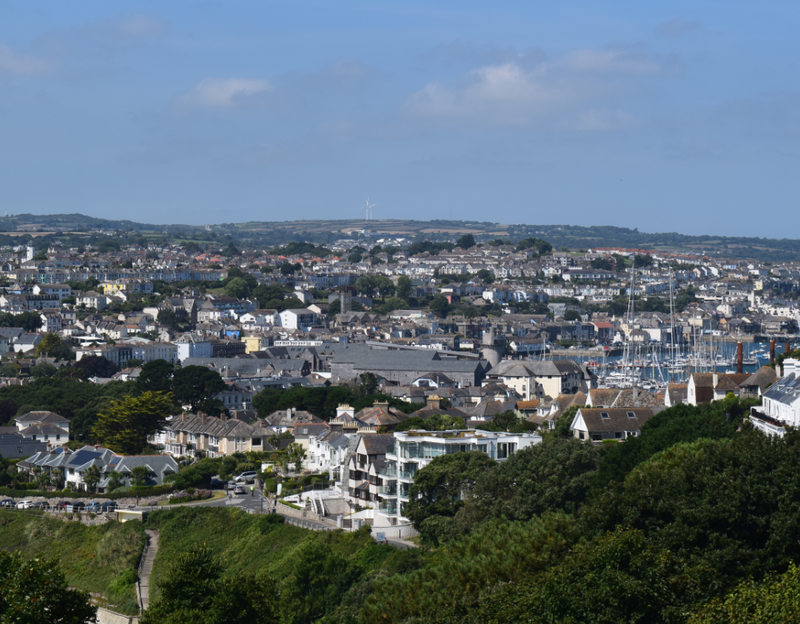 Now the tourism came into fore and town is one of the biggest seaside resorts in Cornwall. Pic. 43 View on the St. Ives town centre from the harbour during the low tide. Pic. 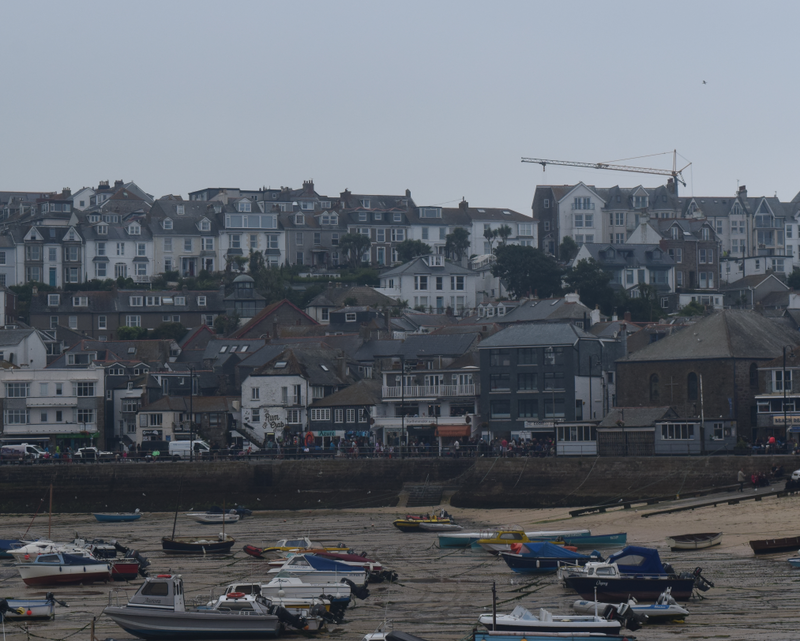 44 View on the St. Ives town centre from the harbour during the low tide (2). I am aware, that in Cornwall is much more attractive places to see. I described only a dozen or so, that I was able to visit during my double journey to this part of the United Kingdom. This camp site is very attractive due to price. 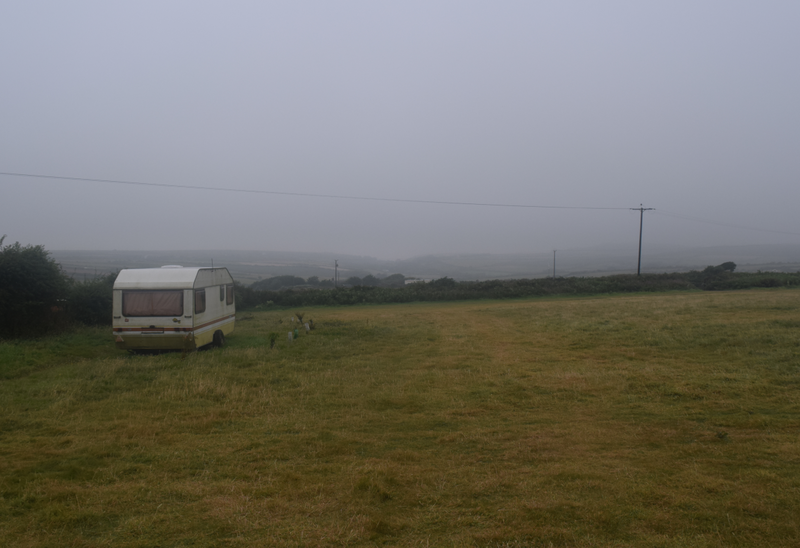 I guess that this is the cheapest camp site in the cornish “corner” very close to the Land’s End, St. Michael’s Mount, etc. 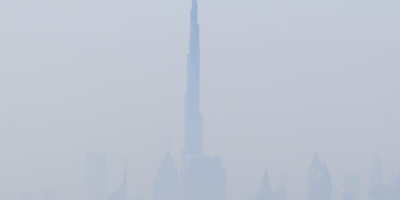 Unfortunately during your stay you will have one big enemy – the weather, which is very unforgiving in this place. The wind is really strong even during the night and cloudiness may occur much often than in different places. The camp site is located on the windward facing slope. Temperature is also low due to the wind. Pic. 45 Numphra Downs Farm campsite with a nice view towards west. During a fair-weather days you can see the seaside from this place. This camp site is perfect for people, who likes adventure. Staying here you can feel like scout. I really liked this place. Lizard Point was for me one of the best places, where I could sleep. The price os staying is really nice. This accommodation is located outside the village and easy accessible by car. From here you can take a walks alongside the shore. If I would complain a little bit there is no beach in the proxime vicinity. The closest one is the Housel Bay Beach located east of the Lizard Point. You need to walk around 15 min. Anyway I would recommend this place as a (probably) the best place to stay in Whole Cornwall with nice view on the English Channel and also with a clear night sky. 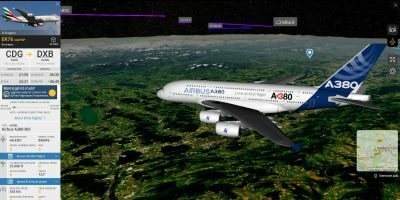 During the good weather you are able to capture the light glow from Brest, located on the opposite side of the English Channel (Canal La Manche) in France, around 180 km on the beeline from Lizard Point. Pic. 46. YHA Lizard Point outside. Pic. 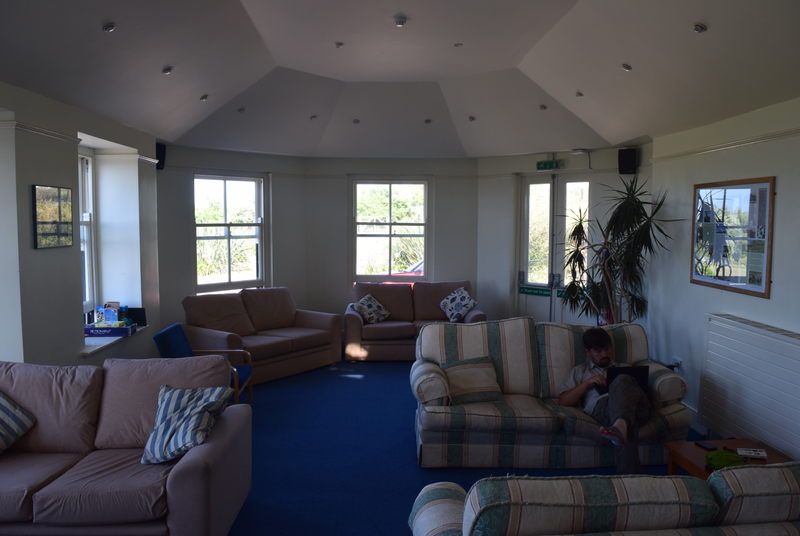 47 YHA Lizard Point dayroom. Pic. 48. Night sky seen from the Lizard Point. 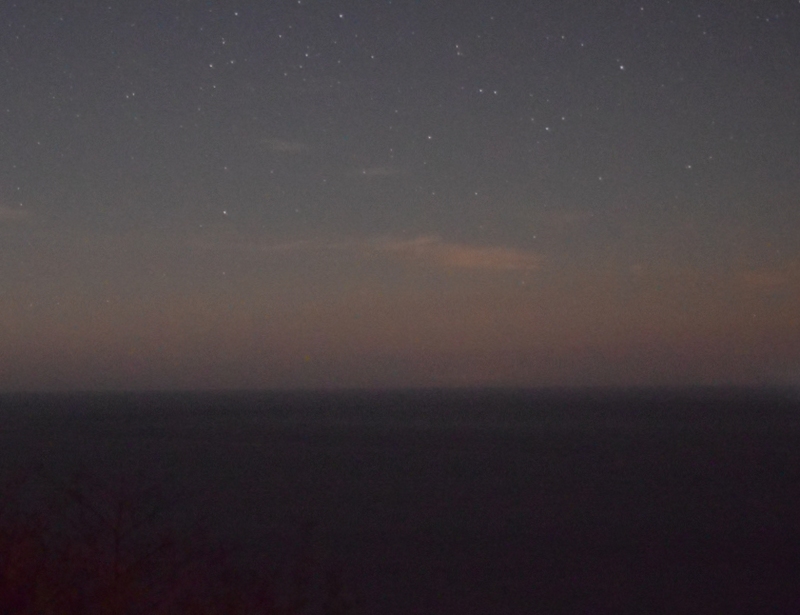 See a small light glow in the middle of the horizon, just above the seawater. There is Brest, city, which lies on the opposite side of English Channel in France, 55 mm. At the finish I would like to tell you, what would I do when I would back to Cornwall again, where would I stay and what trips would I manage. 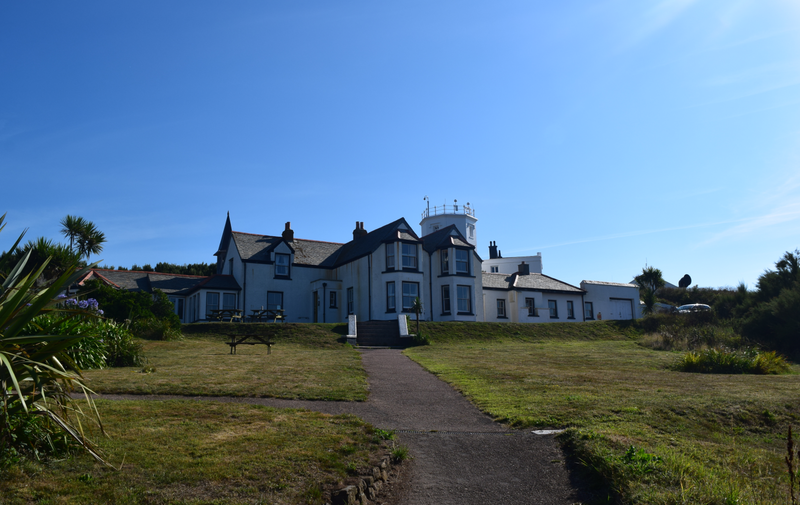 If I would chooise the accommodation I would select the YHA Lizard point again, because the location is nice and place is really secluded, far from the traffic and turmoil. This is perfect place to take a rest and watch the world go by. Making a daily trips could allow you to make a good and quite cheap shopping in the closest Helston town. From Helston only you can reach the Lizard Point by car anyway. 5. Tamar Bridge (on the way down to home or at the beginning). The distances across the Cornwall are not long. Driving from Lizard Point you can reach the Tintagel Castle after around 2 hours. There are two the most extremal points in Cornwall within one trip. Remember also, that sightseeing duration recommended may differ between some places. Eden Project will soak you for at least 3 hours, similairly to the Tintagel Castle and St. Michael’s Mount (taking into account, that you will pay the admission and go inside) unlike to the Cape Cornwall where basically you can take a few pictures, look around and leave this place after half an hour. It’s up to you. I hope, that my article will help you to manage your own trip to this excellent part of the United Kingdom.